The EIPL CD200 dehumidifier has been introduced to serve the demands of medium sized areas without the need to use multiple units. Warehouses, factories, offices and other medium scale facilities with ambient temperatures ranging from 33°F can be cured of humidity and condensation problems efficiently and automatically without over burdening costly heating, cooling and ventilation systems. 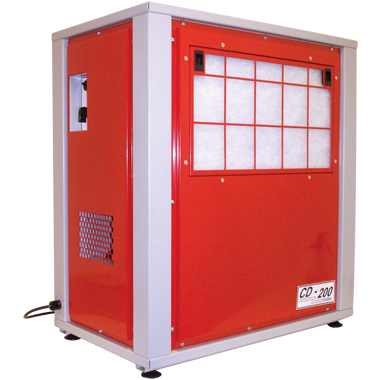 The CD200 unit can be utilized singly or in multiple units to provide protection on any scale. Ducted applications are possible where design requirements specify. Adjustable control humidistat to maintain the level of dryness, Remote humidistat facility, Integral condensate pump with a high capacity pumping height, EIP’s unique temperature sensitive, “Reverse Cycle” defrosting feature which automatically melts away frost buildup providing effective operation at low ambient temperatures, Quiet, 2 speed fan, Self- contained for quick and easy installation, No duct work required, May be ducted if desired, Adjustable feet to facilitate easy installation, Totally enclosed coils in an epoxy-coated heavy gauge steel case. Optional inlet / outlet duct flanges. The CD200 incorporates EIPL’s unique temperature sensitive, “Reverse Cycle” defrosting feature. This proven method of defrosting allows the unit to function smoothly in all temperatures down to 33°F, while maintaining optimum performance at higher temperatures. The twin speed centrifugal fan maximizes air delivery over longer distances. Under maximum conditions the CD200 will condense and remove up to 190ppd. Excess humidity in your warehouse, office, factory or shop results in corrosion, mold growth and rotting. Enormous costs are incurred every year through damage to inventory and through inflated building maintenance costs as a result of dampness. Even if your building seems dry during the day, at night when the temperature falls the humidity rises and the condensation process begins. The compact physical size, and high performance, makes the CD200 the ideal choice. EIPL dehumidifiers are effective solutions to environmental control problems. The CD200 range of units are high capacity dehumidifiers, made to operate at high efficiencies by removing moisture from the air through the refrigeration process. The fan draws the moist air through the cold evaporator coil, which cools the air below its dew point. Moisture forms on the evaporator coil and is collected in the condensate tray, which is equipped with an internal condensate pump for easy removal of collected moisture. The cooled air then passes through the hot condenser coil where it is reheated using the same energy removed during the cooling phase, plus the additional heat generated by the compressor. The air is, therefore, discharged from the dehumidifier at a slightly higher temperature with a lower absolute humidity than that which entered. Continuous circulation of air through the dehumidifier gradually reduces the relative humidity within the area. Because the CD range of units are equipped are equipped with humidistat control, they automatically switch on and off to save energy and expense by maintaining the desired level of humidity with intermittent operation. The remote humidistat feature of the CD200 makes the unit the ideal choice for where remote sensing and control is required Optional duct mounting flanges, reduces the installation time when connecting to an existing / new ducting systems.